I’ve been working on setting up PhpStorm to be my development hub and pare down the number of tools that I’m using if for no other reason than to simplify things. 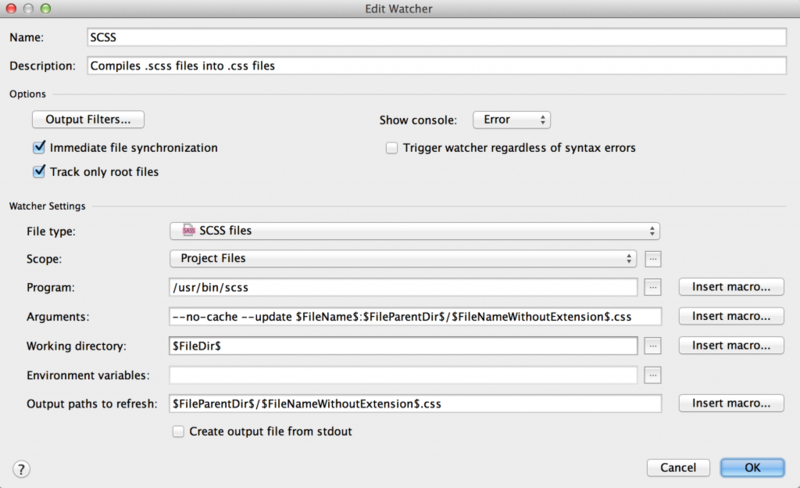 I’m just starting to integrate Sass into my everyday workflow (yah I know, late to the party) and wanted to set up a File Watcher in PhpStorm to help handle that process. Because I use _s (underscores.me) as my starter theme, I was having a bit of an issue getting PhpStorm to save the compiled CSS files in the proper directory (one level up). After some searching and asking some questions (thanks @Rarst!! ), these are the settings I found worked for me. Since I had trouble finding the right mix, I leave this here in hopes it will help someone else.